Luxury fashion retailer Net-A-Porter Group is on a mission to become a media company with the launch of its own global fashion magazine Porter. Porter, powered by Net-A-Porter.com, is a global magazine for and about women, brought to you by the smart people behind the luxury fashion empire Net-A-Porter Group, which includes a stable of sites such as Net-A-Porter, Mr Porter, The OutNet. The launch of the Fashion Magazine, which will produce a print and digital version, is the first major play in the media space by the group, which produces a number of custom publications through its sites. Net-A-Porter is banking on the brand’s 8.3 million customers worldwide to help grow the glossy title, which aims to compete with the likes of Vogue, Harpers Bizarre and Marie Claire. Porter will be available on newsstands around the world, as well as via subscription and the downloadable digital edition, the magazine will publish six issues a year and focus on fashion, beauty, culture, travel and art. 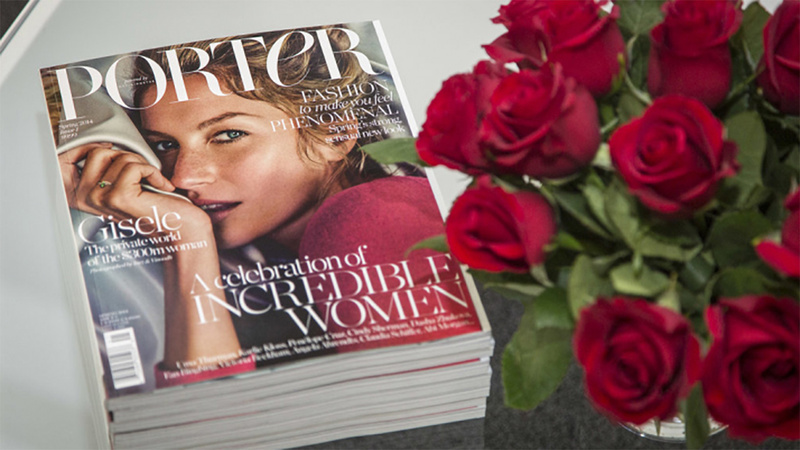 The digital edition will contain links enabling readers to purchase via Net-A-Porter.com, while the print version points readers towards the shoppable features. “In Porter, not only will you find an authoritative global point of view and a bespoke curation of fashion, beauty, travel and culture in one luxurious glossy package, but also the quickest route to shopping that shoe, reading that novel, or booking that trip of your dreams—thanks to Net-A-Porter’s easy-to-use app” said Editor-in-Chief Lucy Yeomans. The title is aimed at women who are “chic, intelligent and adventurous” the title, like the flagship site, aims to attract stylish, classy women with high disposable income. “It’s their desire and demand for a global edit that we’re answering with the launch of PORTER. Our publishing mission is to be world-class leaders in content and commerce, any time, anywhere and on any platform. We are thrilled with the way the industry has reacted to this launch, from the support of the advertising industry to the enthusiasm of the global news trade,” said Macleod-Smith in a statement. Launching a global print magazine at a time when media companies and publishers are downsizing, closing and axing titles is an interesting move. There are many who consider print magazines to be ‘a dying industry’ as print publications battle with falling readerships and declining sales. Well, except for the print magazines that are growing successfully and the ones that continue to maintain loyal readers, that is. There are some who actually believe there is plenty of life in good magazines, clearly that is the thinking of the team behind Porter. The launch of a global fashion title takes bravery and also reveals a strong understanding of the audience and what they want. Women want fashion in print, not via digital. Sure, they want to shop online, but they still enjoy flicking through a glossy magazine – in fact they find it more fun. Net-A-Porter understands this, they understand their target audience and they have listened to this audience and given them what they want. Imagine that? This is exactly what traditional media companies should be afraid of, non-traditional media companies, who aren’t beholden to the “but that’s the way we’ve always done it” rules, coming along, shaking things up by listening to what people want and providing it. Red Bull proved there was a huge appetite for all sorts of content that traditional publishers hadn’t considered worthy of covering. What is perhaps most fascinating is the large element of shock and indignation within the industry that the brand would launch a print product when the future of content is digital. It’s not the first time Net-A-Porter has set out to defy popular thinking, when the fashion site first launched people believed the luxury shopping experience couldn’t be replicated online, Net-A-Porter not only defined how luxury fashion developed online but helped pave the way for many other fashion brands to follow. So why is a trailblazing digital business launching a print magazine? Massenet told Business of Fashion: “We’ve talked about how the Net-a-Porter Group is actually not just a retail company, but it’s a media company. And if we’re a serious media company we couldn’t ignore one of the most important existing media, which is print. A worthy statement, but perhaps Net-A-Porter Group chief executive Mark Sebba’s comments to The Wall Street Journal also reveal some of the strategic thinking behind the publishing arm. Sebba said that the profit margin on advertising revenue is higher than on retail sales, which makes the publishing side of the business an attractive income stream. Clearly looking to grow the brand and its influence, Net-A-Porter Group has high hopes for Porter as the beginnings of its media empire. One thing is for sure, a custom title, this ain’t. Porter is a genuine, stand-alone print magazine and it’s set to shake the market up. Sure, it is powered by the fashion retailer, but its content is on par with what you might find in Vogue or Harper Bazaar. To ensure this, Net-A-Porter has recruited the best of the best to do it including former Harpers Bazaar editor Lucy Yeomans and former Hearst Magazine publisher director Tess Macleod Smith. Launching this month at New York Fashion Week, Porter magazine made a strong statement of intent, it wants to be a taken seriously as a women’s fashion magazine. The response from British Vogue editor Alexandra Shulman couldn’t have been better if it was scripted when she referred to Porter as “a grand Sainsbury’s magazine”. It appears the fashion brand has taken inspiration from Red Bull, the market leader in all things branded arts and entertainment, a brand that has successfully transitioned from an energy drink company to a media company – that also happens to sell drinks. Porter aims to be a fashion magazine that just happens to sell all the items that appear within its pages. The strategy here is clear, Net-A-Porter is looking to grow its brand and its influence. This is about credibility, influence and power. Net-A-Porter want to be your trusted source of fashion – and more. The brand and its site have power and influence in the fashion world, they are as legitimate as Vogue, but lack the presence, Porter aims to change this. The publication is an extension of the content they have been giving away free on their site for years. But in more-depth and in print with glossy pictures. This is about giving gravitas and presence to a brand that many women adore, and providing them with more reasons to love it. Key to Porter’s success though is offering something different, which is why the global edit angle is so important for them. It provides a USP in a crowded marketplace as well as creating a sense of importance and necessity – the idea that if you aren’t getting a global view, you are missing out. The strategy is about giving women what they want, while also telling them what they want – most of which can be found on the Net-A-Porter site, it’s genius really. One major factor that Porter has going for it is the offer of shoppable ads via the app, which provides advertisers and Net-A-Porter with a brilliant model for success. At a time when media companies are doing everything in their power to diversify into products, it makes perfect sense that a successful retailer with a much adored brand would come at it from the opposite direction. Obviously time will tell how successful this will be for the brand, I’m fascinated to see how it goes. A brave and bold move into branded arts by Net-A-Porter Group. This flies in the face of popular thinking that content must be digital and that’s why I love it so much.